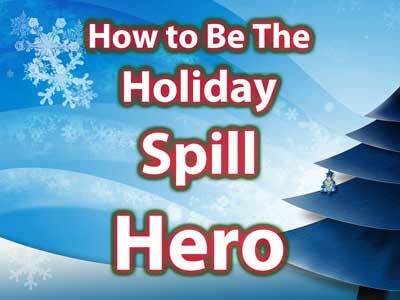 You always wanted to be the Holiday Spill Hero, didn’t you? Never fear – your Holiday Spill Guide is here to turn you into a holiday spot and spill cleaning hero. A spotting kit is great to keep on hand all year long, and comes in especially handy during the high-spill Holiday season. What we’re going to do first is to mix up 3 solutions in 3 different spray bottles: a General Spotter, a Vinegar Spotter, and an Ammonia Spotter. In an empty spray bottle mix 1 TB Dawn dish detergent with 32 OZ water. Cold or warm tap water is fine. Shake well. In an empty spray bottle mix 16 OZ white vinegar with 16 OZ tap water. Shake well. In an empty spray bottle mix 1 TB regular ammonia with 32 OZ tap water. Shake well. I’ve found it best to keep the items together by putting them in a tool caddy like this one (click here). That way when you have an emergency spill you’ll have all of the spotting solutions and accessories in one place where you can grab it and go. There is a reason why we’ve selected white vinegar, regular ammonia, and peroxide for our emergency spotting solution kit instead of using over-the-counter spot grocery store cleaners. It’s because each of these products, when properly diluted as explained above, are safe, work extremely well, do not leave a sticky residue, and dry to a neutral state. You see a lot of the over-the-counter solutions can do a good job at removing some of the items we’re going to cover below, but most of those products leave a nasty residue that may cause further issues with resoiling and other secondary issues. Our spotting kit combined with carefully following the instructions below won’t cause secondary damage like overwetting, bleaching, or resoiling. Caution: Goof-Off is a non-volatile dry cleaning solvent and needs to be handled with care as it can break down the latex backing of carpet if over-applied. Goof-Off always needs to be dissolved and removed with the General Spotter or Ammonia Spotter otherwise it may cause resoiling issues. Let’s move on to classification of the spills and then to the spotting techniques to turn you into the holiday spill hero that you always wanted to be! There are a few spills/stains that are both water and oil-based. Ballpoint pen ink is one that has both water and oil components. Some types of salad dressing also contain oil and water. Gravy is yet another. Knowing whether the spill is water or oil-based will tell you what spotter you want to reach for. As we all recall from general science class, water and oil don’t mix. So when there is a water-based spill we do not want to grab the Goof-Off because it’s not going to work. And we don’t want to reach for any of the 3 spotters that we mixed if it’s a heavy oil or grease spill. Just remember – if the spill is water-based, we’re going to use one, two, or all three of our spotters that we mixed above. And if it’s oil-based, we’re going to reach for the Goof-Off. Let’s turn the page and make you the spot cleaning hero this holiday season! We’ll start with water-based spills since that is the majority of spills you’re going to encounter around the Holidays. But before we proceed I need to add a little disclaimer. These techniques work very well, but they may not work 100% of the time and some of the spotting items may cause damage if improperly used. You should NOT perform any of these spotting techniques on extremely delicate fabrics and fibers such as silk, linen, animal skins, and some types of wool. Also, never rub or scrub a spot as fiber distortion may occur. As long as you follow the directions closely, these techniques are safe and effective for virtually all sturdy fabrics and fibers including: polyester, nylon, olefin/polypropylene, acrylic, and cotton. If the spill is solid or semi-solid, like feces, cranberry sauce, warm or melted chocolate, vomit, etc., the first step is to scoop up the majority with the metal spoon in your spotting kit and discard into the toilet or a garbage bag. If the spill is liquid, fold up a few white clean and dry towels from your spotting kit, place over the spill, and step on it to coax the spill into the towel. Carpet and upholstery always dry from the bottom up which can cause a condition called “wicking” where contaminants in the pad or cushion can rise to the surface as it dries. To prevent wicking, after you are done spot cleaning the liquid spill using the techniques below, fold up several white clean and dry cotton towels from your spotting kit, place over the spill, and weight down the towels with something heavy like a brick.Check after 12 hours. If the spill is still there and transferring into the towel, repeat the spotting techniques below and weight down with more clean, dry white cotton towels.Repeat as necessary until the spill no longer wicks into the towels. When you work on a spill or spot, always work from the outside in to contain the spot and keep it from spreading. If you run into any issues or are just not sure what to do, feel free to call us at 810-225-2184 and we’ll walk you through the steps. Wine is made of fermented grapes, sugar, yeast, and a few other additives – and it’s always water-based. Beer is made of fermented grains, sugar, yeast, and a few other water-based ingredients. Coffee is water-based, of course, but coffee beans contain an oily substance called “tannin”. This tannin releases from the bean and is deposited into the coffee during the brewing process, and oftentimes needs to be treated after the majority of the spill has been cleaned up. Tea is water-based but some types of tea, especially herbal tea, contain disperse dyes which may cause the area to appear darker. Following these suggestions should neutralize and lighten or completely remove tea stains. While all of the components of juice are water-based, juice oftentimes has food coloring added to it to make it look more presentable. Milk does contain a little bit of fat, which is indeed oil-based. However, it’s not enough for us to have to use the Goof-Off. Milk will sour over time so it’s best to attempt removal right away. Eggnog, like milk, does contain some fat – but not enough for us to reach for the Goof-Off oil-based spot remover. It’s all water based with trace minerals and some other stuff in it. Ick. Vomit contains bile, which is very acidic. Feces is water-based semi-solid or liquid (diarrhea) protein matter that contains bodily waste materials. 100% water-based, but some brands add food coloring to make it look more appetizing. Chocolate is mostly water-based but contains some fat in it from milk. Not enough for us to use Goof-Off, though. Basically contains sugar, water, and food dye. The food dye component may be a little tricky to remove, but the sugar and other water-based additives should come right out. Gravy contains both water and oil-based substances; however it can be coaxed out with our water-based spotting kit solutions by carefully following the steps below. 9. Since gravy has a thick viscosity, you may encounter wicking so as a last step fold up several white clean and dry towels from your spotting kit, place towels on the spot, and weight down with a brick. Check progress in 12 hours or so. If the spot is still wicking, repeat step 6. then fold up several more clean and dry white terry towels, place on the spot, and weight down again. Repeat as necessary util the spot is wicked out. 100% water-based, although some brands use food coloring to make the product look more rich. Mustard, turmeric, and curry all have a naturally-occurring disperse dye that causes the product to give its yellow appearance. Fortunately yellow is fairly unstable and can normally be removed with patience. Follow directions here closely, please. 9. Yellow disperse dyes, like found in mustard, turmeric, and curry, may need multiple treatments of the 3% hydrogen peroxide treatment. Repeat Step 8. until yellow is gone. As a general rule Oil-based spills are more tricky to remove than water-based spills. Once oil contaminates the padding or cushion it can be very difficult to completely remove. Following these steps closely will help, but you may need to call us for further instructions at 810-225-2184. 7. Fold up several clean white cotton towels, place on spill, and weight down with a brick for 12 hours. 8. If spot remains, let dry completely and repeat Steps 2. through 7 until the spill is completely gone or there is no more transfer into the towels. 8. Fold up several clean white cotton towels, place on spill, and weight down with a brick for 12 hours. 9. If spot remains, let dry completely and repeat Steps 2. through 7 until the spill is completely gone or there is no more transfer into the towels. Ballpoint pen ink often consists of water/dyes and oil-based ink. This can be a tricky one to remove so please take it easy and don’t overdo it by causing secondary damage to the fibers or latex (if on carpet). Warning: Please follow these directions exactly as ordered- but please understand that even if you do the ink may have left a permanent stain no matter what you try. 3. Blot the Goof-Off dampened towel to the center of the spot being careful not to spread the ink stain. 10. Fold up several clean white cotton towels, place on spill, and weight down with a brick for 12 hours. 11. If spot remains, let dry completely and repeat Steps 2. through 7 until the spill is completely gone or there is no more transfer into the towels.